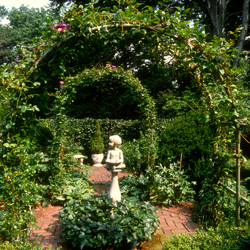 Dr. James Hester’s garden, in Princeton, New Jersey, was the subject of Julie Semel’s in 1989. Dr. Hester was, at differing points in his career, president of New York University (1962-1975), president of the New York Botanical Society (1980-1989), as well as president of the Guggenheim Foundation (1989-2004). The images Semel took of the Hester property show a well manicured space with evergreen gardens with Japanese styling, including a tranquil pond. 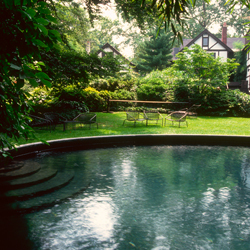 Dr. Hester’s Tudor home also has an interesting history: Woodrow Wilson once resided there when he was the governor of New Jersey, from 1911 to 1913.